Classic, romantic, contemporary, cottagey – lavender has a unique charm that will enhance any style or any kind of garden. It’s an extraordinarily evocative plant: whether you want to conjure up sunlit Provence, romantic Tuscany, the Cape of Huguenots or an English country garden, lavender will do it for you. The look of the plant, as much as its fragrance, inspires a sense of timelessness, tranquillity and well-being. Formal gardeners may want to grow it as an immaculately clipped hedge, romantic types will want to have it billowing along paths, cottage gardeners may prefer to drift different varieties among mixed plantings of flowers and vegetables. 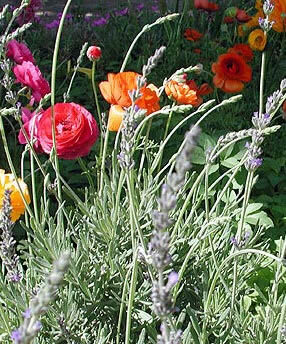 These are just a few of lavender’s many possibilities, which are further enhanced by the many different kinds with different textures, growth habits, leaf and flower form and colour.